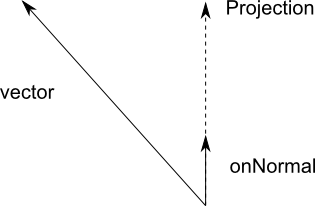 To understand vector projection, imagine that onNormal is resting on a line pointing in its direction. Somewhere along that line will be the nearest point to the tip of vector. The projection is just onNormal rescaled so that it reaches that point on the line. An example of the usage of projection is a rail-mounted gun that should slide so that it gets as close as possible to a target object. The projection of the target heading along the direction of the rail can be used to move the gun by applying a force to a rigidbody, say.